Look! A New Blog Home & Design. Hi there, lovely people. You may have noticed some changes here. The Larissa Monologues got a bit of a redesign and a new home at WordPress. Please bear with me as I work out various wrinkles. I am NOT tech savvy. I am working on updating the RECIPES page, learning to blog on a new platform, and hoping that old links redirect here. 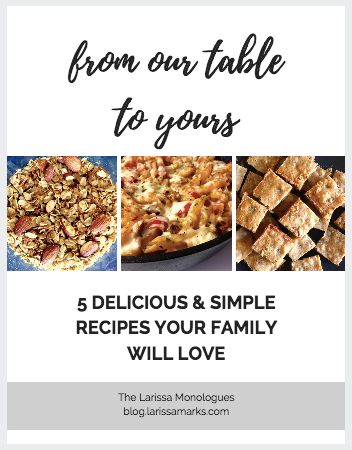 Anyway, I just want to say WELCOME to the Larissa Monologues! If you’re new here, please say hello in the comments.